Egg Harbor Township, NJ – Sept. 25, 2018 – When witches roam the skies and black cats yowl with delight, it can only mean one thing – it must be Halloween! Spirit Halloween, the largest seasonal Halloween retailer in North America, is opening its doors for another ghoulish season. As the premier destination for all things Halloween, Spirit reveals the must-have costume trends for 2018. Fortnite™ Frenzy: Assemble your squad and prepare for victory royale by dressing up as your favorite Fortnite skin IRL this Halloween. Spirit Halloween offers skins like Crackshot, Dark Voyager, Black Knight and Skull Trooper or the option to zip into Cuddle Team Leader, Tricera Ops or Rex Funsies. Drop into Spirit Halloween to discover the best loot including light-up Boogie Bombs, Rainbow Smash and the Pickaxe. Game Time: Spirit Halloween has all the gaming gear favorites covered, including costumes and accessories from Kingdom Hearts, Halo, Assassin’s Creed and Minecraft – a fan favorite for kids and adults. Gaming enthusiasts can also find a variety of Overwatch costumes and accessories from mercenary Reaper to guardian angel Mercy, complete with wings. Hocus Pocus Spells: The cult classic movie Hocus Pocus is celebrating 25 witchy years and Spirit Halloween is lighting the black flame candle with an EXCLUSIVE selection of Sarah, Mary and Winifred costume dresses, wigs and accessories in all sizes. Spirit’s exclusive home décor line and Hocus Pocus Funko POP! figurines would make the Sanderson Sisters cackle in delight. Michael Myers Returns: Just in time for the 40th anniversary release of Halloween, Spirit has adult- and kid-size Michael Myers costumes and masks, and is the place to get a licensed life-size Michael Myers – Halloween H20 animatronic, which wields a kitchen knife and plays the official Halloween theme song. Not to be left in the dark, Spirit has costumes and character string lights featuring the rest of the classic killers, including Freddy and Jason. I’d Rather Be A Unicorn: Dominate social feeds this season by morphing into a coveted unicorn, one of the most legendary animals of all time. Spirit Halloween has all the colors, sizes and accessories to channel creativity for the best mythical costume. Create Your Own Nightmare Before Christmas: Nightmares come true with Spirit Halloween’s The Nightmare Before Christmas collection. Fan favorite, animatronic Jack Skellington, makes a larger-than-life return this year along with Spirit’s new singing Sally and an expanded home décor selection. Celebrating the 25th anniversary of The Nightmare Before Christmas, Spirit’s Jack, Sally and the rest of Halloweentown is a haven for those who look forward to Halloween 365 days a year. Decked Out For Dusk: Into a classic vamp look? Spirit Halloween’s deluxe line of Gothic vampire costumes and accessories will surely entice those who prefer to roam about after dusk. Or, for kids, there’s a never-ending Vampirina selection. Hotel Transylvania brings Mavis, Dracula and the rest of the crew to stores with all-new product designed by Spirit Halloween. Twisted Clowns: Halloween is a coulrophobiac’s worst nightmare. 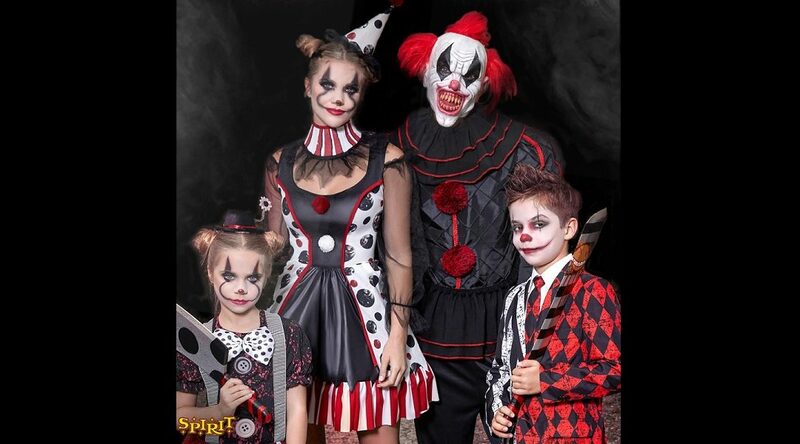 In anticipation of Pennywise’s bloodcurdling return in IT Chapter II next season, Spirit Halloween’s scary clown costumes and animatronics will ensure a good scream as clowns take to the streets. Foodie Culture: Spirit Halloween has all the trendy food-inspired costumes, fully baked and ready to wear. This Halloween, customers can display their foodie love with costumes such as the Popcorn Dress, Cheeseburger costume or Peanut Butter and Jelly couples costume. Out of this World: At Spirit Halloween, extraterrestrial costume separates mesh with glowing lights and flashing orbs that could rival life forms from the ends of the galaxy. Adults and kids can dress up as their favorite astronauts. Or blow friends’ minds with Spirit’s inflatable NASA, alien and UFO costumes. Transform the home into a Halloween haunt with looming animatronics that will make the neighborhood kiddos (and adults) shriek with fear. New to Spirit Halloween this year is a 2-foot-tall Bump ‘N Go Chucky animatronic. Those so brave as to enter Spirit Acres will be confronted with their worst fears – towering clowns, looming spiders and haunted scarecrows! Black cats and broomsticks are just the beginning. Customers can create their own Monster Mash with Spirit’s home décor designed to enchant guests. At Spirit stores, customers will find Halloween scenes for every vibe: black magic, traditional All-Hallows-Eve, scary haunts or spooky séance – Spirit Halloween has telepathically channeled desires! For the inside scoop on all things Halloween, follow Spirit Halloween on Twitter @SpiritHalloween, Instagram at @SpiritHalloween, or on Facebook at www.facebook.com/spirithalloween. Spirit Halloween (spirithalloween.com) is the largest Halloween specialty retailer in the country with over 1,325 locations in strip centers and malls across North America. Celebrating 35 years of business, Spirit is the premier destination for all things Halloween, offering one-stop shopping for everything from costumes to décor and party goods to accessories. In addition to being a fun and interactive event for shoppers, Spirit stores offer complete selections of costumes and accessories for infants/toddlers, children, ‘tweens, teens, and adults along with exclusive décor you won’t find anywhere else. For more information, please visit: www.spirithalloween.com. At the heart of Spirit Halloween is Spirit of Children, a program which focuses on making hospitals less scary for kids and their families. Since its inception in 2007, Spirit of Children has raised over $45 million for the Child Life department at hospitals across the country. Donations to Spirit of Children stay within local communities, with 100% of funds going toward a child’s life. For the 2018 Halloween season, Spirit of Children will be supporting 140 hospitals across the country, with a goal to raise $9 million. Spirit encourages customers to help make a difference in a child’s life this Halloween season by donating at their local Spirit Halloween or spreading awareness via Facebook and Instagram using #SpiritofChildren and #MoreCowbell in their photos. For more information, please visit: www.SpiritOfChildren.com.